Acknowledged author Sharon L. Lewis RN PhD FAAN wrote Medical-Surgical Nursing: Assessment and Management of Clinical Problems, Single Volume, 10e comprising 1776 pages back in 2016. Textbook and etextbook are published under ISBN 0323328520 and 9780323328524. 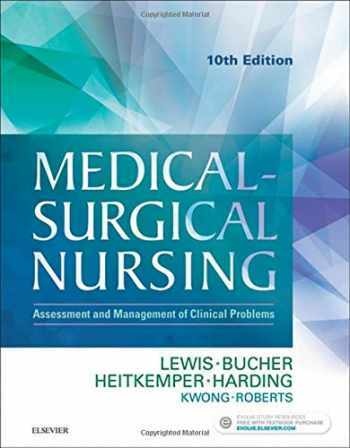 Since then Medical-Surgical Nursing: Assessment and Management of Clinical Problems, Single Volume, 10e textbook received total rating of 4 stars and was available to sell back to BooksRun online for the top buyback price of $61.44 or rent at the marketplace. Awarded first place in the 2017 AJN Book of the Year Awards in the Medical-Surgical Nursing category. Learn how to become an exceptional caregiver in today’s evolving healthcare environment! Written by a dedicated team of expert authors led by Sharon Lewis, Medical-Surgical Nursing, 10th Edition offers up-to-date coverage of the latest trends, hot topics, and clinical developments in the field. Completely revised and updated content explores patient care in various clinical settings and focuses on key topics such as patient safety, NCLEX exam preparation, evidence-based practice, and teamwork. A variety of helpful boxes and tables make it easy for you to find essential information and the accessible writing style and building-block approach make even the most complex concepts easy to grasp. Best of all ― a complete collection of learning and study resources helps you learn more effectively and offers valuable, real-world preparation for clinical practice. Highly readable format offers you a strong foundation in medical-surgical nursing.Content written and reviewed by leading experts in the field ensures that information is comprehensive, current, and clinically accurate.Informatics boxes discuss how technology is used by nurses and patients in healthcare settings.Expanded coverage of evidence-based practice helps you understand how to apply the latest research to real-life patient care.Expanded Safety Alerts throughout the book highlight patient safety issues and focus on the latest National Patient Safety Goals.UNIQUE! "Levels of Care" approach explains how nursing care varies for different levels of health and illness.Bridge to NCLEX Examination review questions at the end of each chapter reinforce key content while helping you prepare for the NCLEX examination with both standard and alternate item format questions.Unfolding case studies included throughout each assessment chapter help you apply concepts and procedures to real-life patient care. Managing Care of Multiple Patients case studies at the end of each section help you apply your knowledge of various disorders and prioritize and delegate patient care.Separate chapter on genetics focuses on the practical application to nursing care of patients.Genetics in Clinical Practice boxes address key topics such as genetic testing, Alzheimer’s disease, sickle cell disease, and genetics-related ethical issues.Genetic Risk Alerts and Genetic Link headings highlight specific genetic issues related to body system assessments and disorders. NEW! Interprofessional Care tables emphasize the importance of total patient care and outline the role of each provider in managing disorders.NEW! Teamwork & Collaboration boxes highlight your role in working with members of the interprofessional team.NEW! Check Your Practice boxes challenge you to think critically and interact with patient data. NEW! Becoming a Nurse Leader boxes introduce you to concepts related to being a responsible team member and leader.NEW! Patient and Caregiver Teaching chapter includes a stronger focus on informatics to reflect the current use of technology as it relates to patient self-management.NEW! Core clinical content focuses on highlighting and incorporating QSEN competencies.